How are the Classroom Challenges presented and organized? How should the Classroom Challenges be used? Why are the Classroom Challenges useful to classroom teachers? Why make time for formative assessment? … all those activities undertaken by teachers, and by their students in assessing themselves, which provide information to be used as feedback to modify the teaching and learning activities in which they are engaged. Such assessment becomes ‘formative assessment’ when the evidence is actually used to adapt the teaching work to meet the needs. Download A brief guide for teachers and administrators for more details. Concept Development Lessons which help students and teachers realize the CCSSM requirement that “Proficient students expect mathematics to make sense.” These lessons are designed to reveal and develop students’ conceptions, and misconceptions, of significant mathematical ideas and how these connect to their other knowledge. Problem Solving Lessons which help students and teachers also realize the CCSSM requirement that “They take an active stance in solving mathematical problems.” These lessons are designed to assess and develop students’ capacity to apply their mathematics flexibly to non-routine unstructured problems, both from the real world and within pure mathematics. Thus, the concept development lessons focus on assessing and developing conceptual understanding, while the problem solving lessons will focus on the application of previously learned mathematics to non-routine problems. The lessons are built around rich tasks that assess how far students can “think with mathematics”. Both sets of lessons will help teachers to reveal, examine and then consolidate their students’ often-fragile learning and thus to advance their performance in mathematics. Lessons also contain detailed guidance for the teacher on ways to interpret student responses and on providing appropriate interventions, as well as solutions to the tasks. The concept develpment lessons are designed to be used by teachers every few weeks, over one or two class periods depending on how the school has organized mathematics instruction. They may be used in the middle of a curriculum unit on the topic, to gauge and improve students’ level of understanding, and/or they can be used later in the year as review and support. The problem solving lessons are designed to be used from time to time through the year. 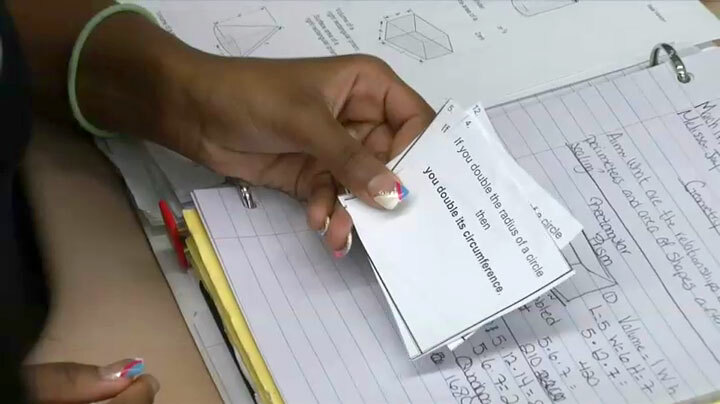 They help students connect all the math they have learned, gaining deeper understanding of practical situations and rich problems in pure mathematics. Proficient students expect mathematics to make sense. They take an active stance in solving mathematical problems. When faced with a non-routine problem, they have the courage to plunge in and try something, and they have the procedural and conceptual tools to carry through. They are experimenters and inventors, and can adapt known strategies to new problems. They think strategically. The CCSSM describe the various elements of what students should know and be able to do. The summative assessment tasks, illustrated with student work at various levels, show what the standards look like in performance terms. They enable teachers to assess student performance and, through the Classroom Challenges, to move each student’s reasoning forward. In this way they help classroom teachers translate the vision of CCSSM into their own classroom. Black and Wiliam also describe in their review (cited above) how research shows that, when properly implemented, formative assessment leads to remarkable gains in student learning. Classroom Challenges are designed to enable teachers to realize this potential. Built around rich tasks, they provide a “critical supplement” to any curriculum, designed to present a lesson every two weeks and help teachers adjust the rest of their instructional time. The key to formative assessment is to focus on qualitative assessment of each student’s reasoning on rich tasks. Giving scores or other summative statements will undermine effectiveness by distracting students attention from the teacher guidance that will move their reasoning forward. 2) motivate learners by showing them what we value and what they still need to learn. However the realities of the multitude of demands and pressures that teachers face can make them doubt whether there is enough time in the school day for their students to learn more deeply. But as U.S. college basketball coaching legend, John Wooden said, "If you don't have time to do it right, when will you have time to do it over?" It is important to understand that the gains in robust long-term learning make formative assessment highly time-effective. These gains are illustrated in the data shown in the diagram below, which comes from one of a series of studies comparing teaching that is based on formative assessment (diagnostic teaching) with the traditional direct instruction approach (positive reinforcement). Of special note is that the gains during the period of instruction, pre-test to post-test, were comparable. However, the results of the formative assessment group on the delayed test, taken several months later, showed little of the fall-off in the traditionally taught class – a lack of retention that is familiar to every teacher. All the series of studies, with different teachers, different classes and different math topics, showed similar results. 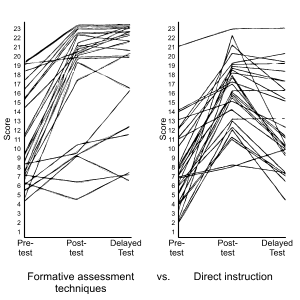 Results from work at the Shell Center showing how teaching based on formative assessment techniques improves long-term retention of learning. The Classroom Challenges build on these techniques.